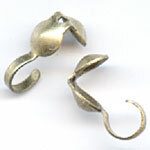 These types of crimps are used to attach a fastener at the end of your work. They give a professional look to the finish of your work. 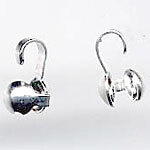 They can also be an easy way to attach several strands of beads to your fastener. Even though most of these terms are used interchangeably, the purist will say that there is a distinction between a calotte crimp vs. a clamshell crimp. Most people would not make a lot of distinction between these variations as far as their names are concerned but how you would use them in finishing your work is a bit different. Calotte crimp - is side-opening with no holes. Clam shell crimp - opens at the end and has a hole in the fold-section.